Have a party and bring out the coolest cake in town! Bake up a tasty treat in one of your favorite LEGO® shapes with this easy to use, easy to remove silicone baking mold that can be used in both the oven and microwave, and cleans up quickly in the dishwasher. Bring a minifigure to life with this fun cake mold! The Minifigure Cake Mold (853575) Lego set is no longer directly available from the sites below. However, 3rd party partners of these sites might still have the set available. 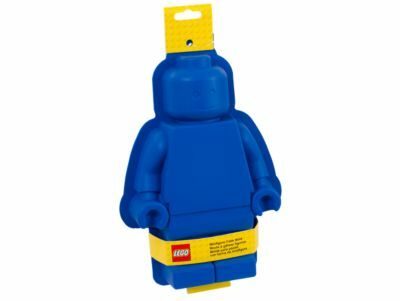 Alternate description Show off your love of LEGO® minifigures with this silicone minifigure cake mold in bright blue. It's also oven, microwave and dishwasher safe. Iconic minifigure shape in bright blue. Easy slip-out silicone baking mold. Oven and microwave safe – min. approx. 20°C (68°F) – max. 230°C (450°F). Dishwasher safe – max. 65°C (150°F). Measures over 12” (30 cm) long, 8” (20 cm) wide and 2” (5 cm) high.